The Little Calorie Deluxe is an easy-to-use weight loss program for people that want to take control of their weight and training. The Little Calorie Deluxe is an excellent program for people that want to lose weight in a controlled speed and healthy way. There are no slim fast dieting tools but The Little Calorie Deluxe is at least fun to use. The Little Calorie Deluxe is a diet diary and planner that helps you count calories both what you eat and what you lose by exercise. 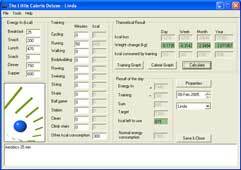 The Little Calorie Deluxe is very fine software for people that want to get an overview of their training because of its easy-to-use interface and its fat burner and training diagrams. The Little Calorie Deluxe supports both kilograms and pounds in its weight calculations. A fun feature is the "Diet Diary Notes". It is a text field where you can write your own diary comments. This is the perfect replacer for the calorie counter spreadsheet.